This article addresses the process of adding drivers to the WinPE rescue media. 1. Why do I need to add drivers to WinPE ? 2. What devices should I add drivers for ? 3. What makes up a device driver and where do I get one ? 4. How do I check if my devices require drivers adding to WinPE ? 5. How do I update the driver software of a device ? While WinPE is packaged with a large collection of drivers, there are many devices that are not part of the WinPE list of drivers. In order for your device to be recognised by WinPE, you will need to add a driver so that it gets loaded at boot time of WinPE and allows WinPE to "communicate" with your device. How will I be backing up or restoring in WinPE ? If you intend to use a network device then you will obviously need to ensure that your NIC is supported in WInPE. If your hard drives are attached to a RAID controller then you will need to ensure that your RAID Controller is supported in WinPE, either by a WinPE driver or by adding a driver. And so on, apply this basic methodology until all required devices have support. The actual driver software. These files have a .SYS extension. An optional security catalog which signs the drivers for operating system which require signed drivers, commonly used on x64 operating systems. These files have a .CAT extension. Your best source for driver packages is the CD that came with your device (or motherboard) or download from the vendor website as a ZIP file. When download a package from the vendor website, it is best to source a ZIP package for easy extraction. There is a compatible driver in the host operating system (this is only done for Vista and later systems). 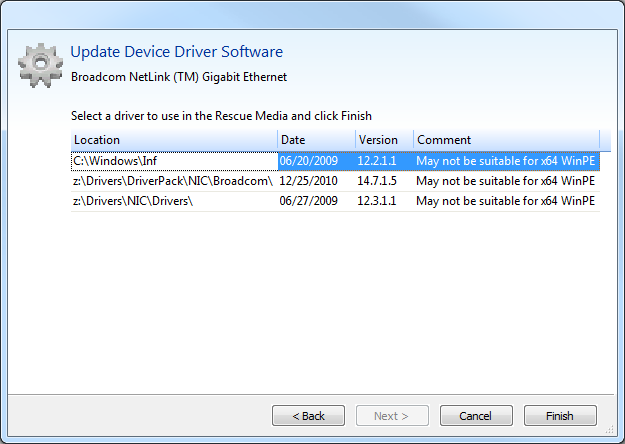 There is a compatible driver already present in the collection of drivers on previously created rescue media. Compatible Device Support in WinPE. Driver already present in Drivers folder. The first thing to note is that it is not necessary to add drivers for devices that are not supported in WinPE, the Rescue Media wizard will not force you to ensure that all devices are supported. The simple reason for this is that you may not be using certain devices when in WinPE, eg: NIC or USB controllers/hubs. The other thing to note is that you can update driver software as well. If a device is already supported you can use a different driver, you do not have to use the driver provided by WinPE for a device. This may prove useful if you are experiencing issues when performing backups/restores in WinPE, e.g. : slow restores from a USB device. Select it by left clicking it in the list of devices. Click the Update Driver button. This will present another wizard. This wizard is relatively straightforward to use, the first page prompts you for a folder to scan for drivers and whether you want to include all sub-folders. 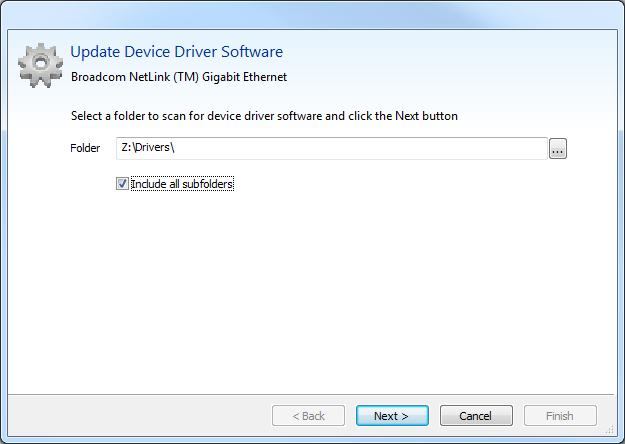 Click Next once a folder is selected and the wizard will scan for drivers. The wizard will automatically include the host operating system drivers if you do not choose to scan that folder. Once complete a list of results will be displayed, select the driver from the list you want to use and click the Finish button, this driver will then be copied to the WinPE disc. Clicking Cancel will abandon the process and not update any drivers. A sample screen-shot of the final page is below. 6. How do I make a bootable rescue environment that is compatible with multiple computers? Note: This technique only works with usb media. 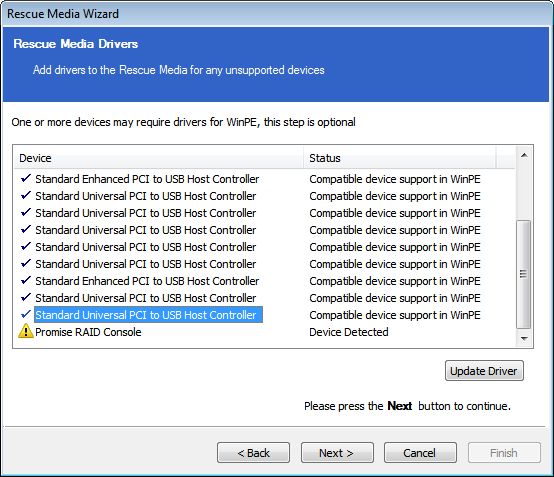 Use the Rescue media wizard to create a bootable usb rescue device on one computer, and then repeat the process with each other computer in turn using the same usb device. Article has been viewed 58,223 times.